On the occasion of World Pneumonia Day, a new report finds that reductions in child pneumonia deaths have not kept pace with other leading causes. A new report released by the Institute for Health Metrics and Evaluation (IHME) on the occasion of World Pneumonia Day finds that international development assistance targeting pneumonia represents a very small portion of overall global health financing. 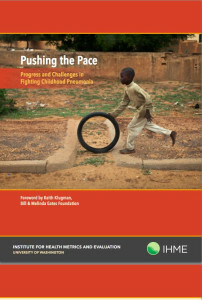 Pushing the Pace: Progress and Challenges in Fighting Childhood Pneumonia finds that in 2011, just 2% ($US670 million) of the estimated $US30.6 billion of international development assistance for health was spent on fighting pneumonia, the leading infectious disease killer of children under five. In contrast, according to the IHME, pneumonia claimed 905,059 children’s lives in 2013, or 14% of all under five deaths. The report finds that reductions in child pneumonia deaths since 1990 (58%) have not kept pace with other childhood killers, for example measles (83%) and diarrhea (68%). Progress has been particularly slow for high-burden countries in sub-Saharan Africa where declines in total child pneumonia deaths averaged just 14%. Nigeria only saw a 4% decline in total child pneumonia deaths and a number of countries, including Democratic Republic of Congo, Chad, and Cameroon, actually experienced increases in child lives lost to pneumonia. The fact that many of the countries that have performed so poorly in reducing child pneumonia deaths have achieved remarkable reductions in reducing child deaths from other causes suggests that the level of investment and disease prioritization are critical factors, and also implies a lack of integration in managing the major childhood killers in these countries. In contrast, countries like China, India, Iran, Bangladesh, Mozambique and Indonesia have all recorded reductions in child pneumonia deaths above 70% since 1990, an indication that dramatic reductions in child pneumonia deaths are possible. The report finds that over 80% of the estimated $US670 million of development assistance for pneumonia in 2011 was invested in vaccine programs, while other areas of pneumonia prevention, diagnosis and treatment, specifically breastfeeding, reducing indoor air pollution, improving pneumonia diagnostic technologies and access to antibiotics and oxygen therapy have not received the same levels of investment. The report suggests that the world needs to mobilize more resources to protect children from contracting pneumonia by increasing vaccine, breastfeeding and clean cooking coverage, and that we must identify and treat the children who contract pneumonia with the right diagnostic technologies, antibiotics such as the amoxicillin dispersible tablet and oxygen therapy where necessary, all of which are still unavailable to the majority of children with pneumonia in most low resource settings. Further, because seven out of every ten child pneumonia deaths now occur in just 15 countries, the report suggests that new investments should prioritize the sub-populations of children in these countries, with a special focus on sub-Saharan populations where child pneumonia deaths are actually increasing.